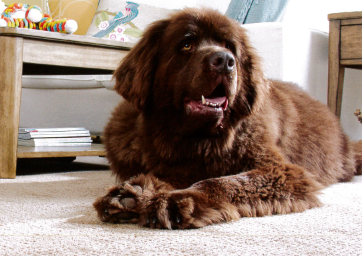 Are Your Pets Wreaking Havoc on Your Carpets? You just spent plenty of money on your brand new white carpet and it is already ruined, what a mess! Whether your pet urinated or vomited on your carpet, it can leave an eyesore of a stain on your carpet; not to mention a horrid smell, too! If your carpet needs a little TLC, we have a few tips and tricks to get out some of the most common pet stains. Before beginning, place a few paper towels on top of the area to soak up any liquids. Mix up all the ingredients in a spray bottle and spray directly on the urine stain. Let sit for 5-10 minutes and blot with a soft cloth. If the stain is heavier, sprinkle a little baking soda directly on the stain and then pour 50/50 mixture of vinegar and water on the area and let sit for 5-10 minutes. If your furry family member happens to get sick on your carpet, don’t worry. We have a solution that can help remove the smell and the stain from your carpet. This easy, at-home solution is used on vomit stains, which are typically harder to remove. Before beginning, remove the larger chunks from the vomit and blot the area with an old towel to soak up excess moisture. Mix all the ingredients together in a medium sized bowl. Dip the old towel or soft cloth into the mixture and apply to the stain. This may need to be done a few times because vomit stains are more difficult to remove. Mix hydrogen peroxide and liquid detergent together in a bowl. Sprinkle baking soda on the stain. Next, pour the liquid mixture on the stain. Gently rub the area with a soft bristled brush or a cloth and let it sit for about 10 minutes. After, use a towel to remove excess liquid and go over with a vacuum. Depending on how big and deep the stain is in your carpet, you may need to repeat these steps multiple times. Are you sick and tired of cleaning up your pet’s messes? Our Pet Protect Stain Master Carpeting will resist pet hair, reduce pet odors, its easy to clean and its the most durable carpeting out there. Visit us today and ask about our Pet Protect Stain Master Carpets! Reap the benefits of luxury vinyl flooring in your home!